A couple of weeks ago, I dabbled in the Whole30. (If you’re not familiar with it, it’s a grain-free, sugar-free, dairy-free way of eating, and the goal is to help you to understand how different foods make you feel.) I have a ton of respect for people who commit and do it – I’m probably never going there, but I dipped my toes in and at the very least, I’m still doing a weird thing wherein I eat a big salad for breakfast a few times a week, and taco bowls with roasted sweet potatoes were born! 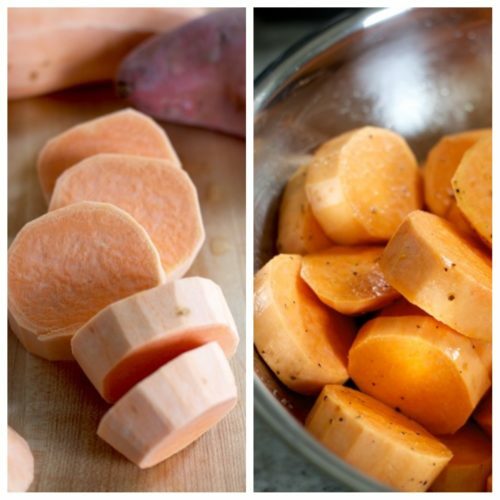 So: start with the sweet potatoes. Slice them up into rounds, and toss them with oil, salt, and pepper. It’s SO simple…the magic happens in the oven, where the potatoes steam under a foil cover, and then roast and get crispy. While the potatoes are cooking, chop up a BUNCH of veggies. (I like to use an onion, a bell pepper, mushrooms, a jalapeño, and a ton of spinach, but you can really empty your fridge with this one and use anything you like! I think grated carrots or zucchini would “hide” in there really well, too.) Just toss them into a pan with some olive oil as you get them chopped up (start with ones that take longer to cook, like onions, and save quick-cooking spinach for the very end). Then brown the meat and mix it all together with cumin, chili powder, and a can of tomato sauce! 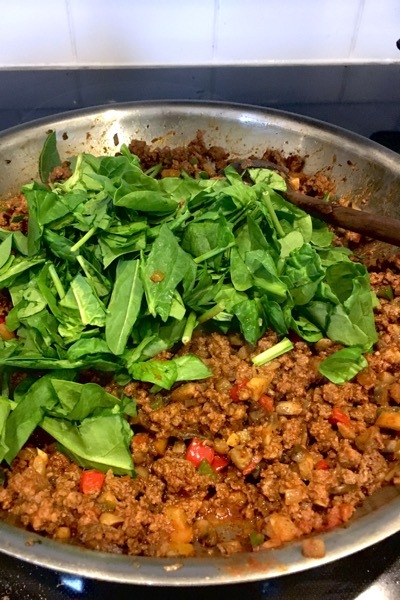 If you think maybe all those veggies are going to ruin your taco meat experience, do not fear. They really disappear into the sauce and if you chop the mushrooms up small, they just seem like part of the meat! This was a dinner meal that turned into awesome lunches, and I even stuck a serving of the meat mixture in the freezer to pull out for a quick healthy meal! Taco bowls with roasted sweet potatoes are a great “meal prep” option, too, if you like to make something for easy lunches or dinners throughout the week. Both components reheat well and you can also recombine them for other meals (I ate some of the sweet potatoes chopped up in a salad, too, and the meat would also be good over cauliflower rice – or rice rice, or as a regular taco if you’re not Paleo). Love the crispy sweet edges of those roasted potatoes! It’s a perfect bite, right there. Veggie-Packed Taco Bowls with Roasted Sweet Potatoes. Optional, for serving: avocado, cilantro, chopped green onions, salsa, and if you want something crunchy, pumpkin seeds or plantain chips! Stir potato slices in a bowl with oil, salt and pepper until evenly coated. Place them on a foil-lined and greased baking sheet in a single layer. Cover the pan tightly with foil. Put the pan in a COLD oven and turn on to 425. Bake 30 minutes. Remove foil and cook about 15 minutes until bottoms are beginning to brown. Flip slices and continue to roast until tops and bottoms are as brown as you like, about 15-20 minutes more. Heat a large skillet over medium heat and add the olive oil. Add the veggies as you get them cut up (I add them in the order they are listed – if you’re using different veggies, add firmer/longer-cooking ones first and more delicate veggies last). Add a little salt and cook until they are tender. I like to let them get a tiny bit brown, especially the mushrooms. Put the cooked veggies in a bowl and set aside. Put the pan back on the heat and increase the temperature to medium-high. Add the beef and brown, breaking it up with a spoon and stirring as it cooks. When it’s almost done, add the garlic and jalapeño and cook for another minute. Stir in the chili powder, cumin, salt, and pepper. Add the vegetables back in, and the can of tomato sauce. Stir in the spinach and let the mixture simmer for a couple of minutes until the spinach wilts. Taste and adjust the seasoning. 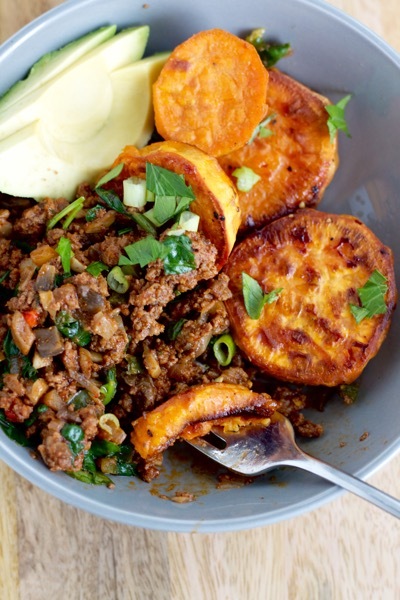 Layer the sweet potato rounds into a bowl, then add a scoop of the taco meat mixture. Add whatever toppings and garnishes you want and enjoy! 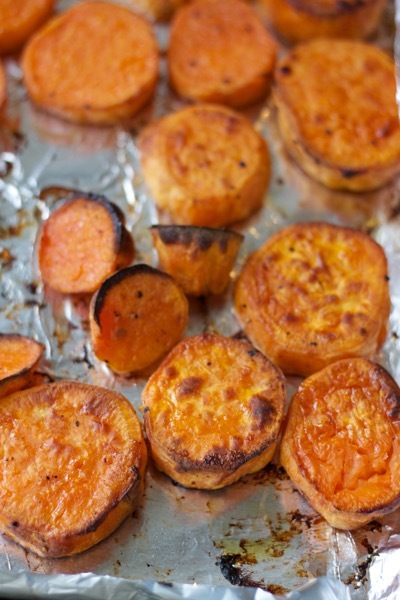 The roasted sweet potatoes also appear on the site here – one of my first posts! The taco meat mixture was inspired by these veggie-packed baked burritos and this faster-than-fast-food taco meat! Carnitas (The Ultimate Crowd-Pleasing, Make-Ahead, Freezer-Friendly Party Meal - Part 1). These are awesome! All those veggies in one bowl… perfect for me! Delicious! and super easy. I made this for the first time tonight and it was a big hit. welcome to the recipe rotation taco bowl! 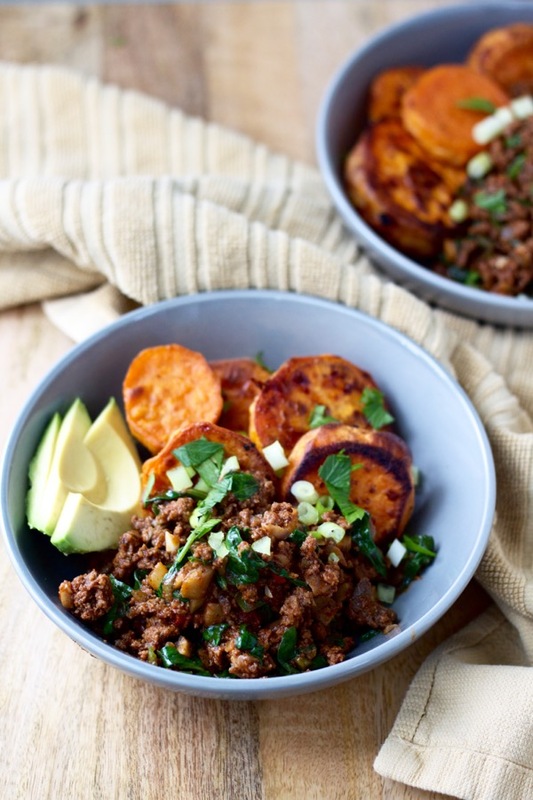 I love the idea of sweet potatoes with Mexican flavors – I’ve never done it before but I’m now I’m very into the idea! This was delicious! I’m not doing Whole 30 so I added a can of black beans too. Yum!! Thanks Bet! Perfect! Thanks for reporting back – I love it! !